4100 series stainless steel cable railing assemblies 2-3/8" long Receiver and 1 1/2" Push-Lock™ fitting. Perfect for use with C.R. Laurence posts. 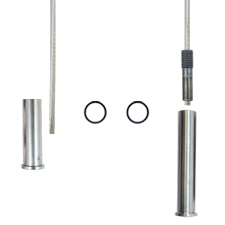 An Invisiware® Receiver tensioning device is supplied on one end. Install the receiver into one end post, string cable through the intermediate posts. Cut cable, insert into Push-Lock™. Tension the cable by turning the Receiver using an Allen wrench.